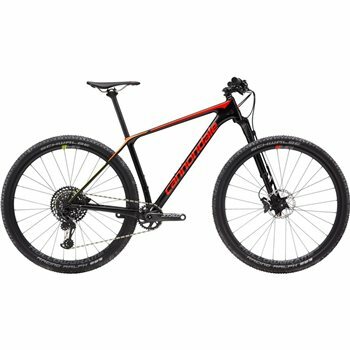 If your life revolves around the quest for podiums; if you weigh, measure and analyze every element of your preparation, if your idea of fun is turning yourself inside out till your eyes bleed and your competitors drop; basically, if you’re obsessed with XC, the all-new F-Si is the bike for you. Built to climb faster, descend harder, and sprint better than any other hardtail out there, it’s serious XC goodness for those with serious XC issues. The fastest, best climbing, best descending XC hardtail on the market. One of the lightest XC hardtails in the world, the new F-Si is over 300g lighter than the previous version. Frame shaves 70g and the new Lefty Ocho chops a whopping 250g. Slacker head angle than previous F-Si adds even more stability and control on sketchy descents. Custom 55mm long fork rake on the Lefty Ocho keeps handling precise and agile at slower speeds. Ai offset drivetrain delivers even shorter chainstays than the original, for climb-winning traction and agility, with clearance for big tyres, 2x chainring compatibility and a stiffer, stronger rear wheel. Reach to the head tube is increased slightly for improved control. An integrated seat binder looks super clean and exposes more seatpost length for improved comfort. Frame: ALL-NEW F-Si, BallisTec Carbon, SAVE, PF30A, tapered head tube, Speed Release 12mm thru axle, Ai Offset. Fork: ALL-NEW Lefty Ocho, 29", 100mm, Chamber Damper with cable lockout, OppO Spring System, tapered steerer, 50/55mm offset. Rims: HollowGram 23, Superlight Hi-Impact Carbon, tubeless ready, 28h, 23mm inner width. Hubs: Lefty 60 front, HollowGram 12x148 rear w/ DT Swiss internals. Spokes: HollowGram, double-butted straight pull (Ai Offset dish - rear). Tires: Schwalbe Racing Ray 27.5/29 x 2.25" front, Racing Ralph 2.25" rear, Snake Skin, Addix Speedgrip Compound, tubeless ready. Crank: Truvativ Stylo Carbon, 34T, Ai Custom. Chain: SRAM GX Eagle, 12-speed. Cassette: SRAM XG-1275, GX Eagle, 10-50, 12-speed. Rear Derailleur: SRAM X01 Eagle. Shifters: SRAM X01 Eagle, 12-speed. Handlebar: Cannondale C1 Flat, Carbon, 8° sweep, 760mm. Stem: Cannondale C1, 7075 Alloy, 1-1/8", 31.8, 7°. Headset: Integrated, 1-1/8 to 1.5", sealed angular contact bearings (Integrated steer stop size small and extra small only). Brakes: Shimano Deore XT hydro disc, 160/160mm XT rotors. Brake Levers: Shimano Deore XT hydro disc. Saddle: Fabric Scoop Flat Race, ti rails. Seatpost: Cannondale C1 Full Carbon, 27.2 x 350/400mm.